The history of Orlando goes back many years before Walt Disney came to town. It has saddened me for years that most of the millions of tourists who visit central Florida's theme parks each year have never seen the real Orlando. 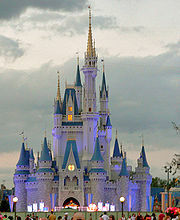 Walt Disney World, for example, is almost 20 miles west of downtown Orlando Florida. International Drive, Lake Buena Vista, Osceola County and the area around the theme parks has expanded to serve the tourists. But it is not the real Orlando, Florida. They came along very recently in the history of Orlando. Orlando’s modern history dates back to 1838 and the Second Seminole War. The U.S. Army built Fort Gatlin southeast of present day downtown Orlando to protect settlers from the Indians. By 1840, a small settlement known as Jernigan had grown up around the Fort. The name came from the Jernigan family, early settlers in the area. By 1850, Jernigan had a post office, and by 1856 the community had expanded northward, and changed its name to Orlando. In 1857, the U.S. Post Office adopted the name change. The Town of Orlando was incorporated in 1875 with 85 residents, 22 of whom were qualified voters. Now for the part of the history of Orlando that is still cloudy: where did the name come from? There are at least five versions that I know about how the town became known as Orlando. An early politician, Judge Speer,named the town after a man named Orlando who worked for him. The same Judge Speer was a Shakespeare fan, and named the town after Orlando, a character in the play "As You Like It". A man named Mr. Orlando was passing by on his way to Tampa with a herd of ox. He got sick and died. The locals buried him and folks would refer to the place as "there lies Orlando". Orlando Reeves was a U.S. soldier on sentry duty one night during the Seminole Wars. He spotted a disguised Indian sneaking up on the troops, and fired his gun to warn his fellow soldiers. He was killed by Indian arrows, but his warning saved the troops. They buried him on the south side of Lake Eola in what is now downtown Orlando. A man named Orlando Reeves owned a sugar mill and plantation north of Orlando in what is now Volusia County. He carved his name in a tree near what is now Lake Eola. Later settlers assumed the tree was a grave marker. Their speculations as to the carving's origin led to the various accounts of Seminole War battles, and the area around the tree became known as "Orlando's Grave" or simply "Orlando." Orlando citizens have their own favorite version. I recently heard from Carolyn Pangborn, a descendant of Judge Speer. She provided historical references which lead me to believe it was the Judge who came up with the name. The name was timely because the history of Orlando since the end of the Seminole Wars has been one of steady growth. Shortly before the Civil War, Orlando became the seat of newly created Orange County. It was a quiet country town during the war, but had a population explosion in the years from 1875 to 1895. In that 20 year period, Orlando became the center of Florida's citrus industry. The "Great Freeze" of 1894-1895 forced many small owners to give up their groves. Owners of bigger groves added to their holdings, and they became "citrus barons". Many of them bought land and expanded their operations south of Orlando in the area around Lake Wales. The Town of Frostproof south of Lake Wales did not get its name by accident. Orlando, as Florida's largest inland city, became a popular resort during the years between the Spanish-American War and World War One. The Florida Land Boom also affected Orlando in the 1920's. Land prices skyrocketed. Many magnificent tourist facilities, such as the elegant San Juan Hotel, were built during these heady years. During this period many neighborhoods near downtown Orlando were developed. The many small bungalows that still exist in these areas are part of the history of Orlando and a key component of the city's charm. There was a lot of military activity in Orlando before, during and after World War Two. The municipal airport just north of Lake Underhill was converted into Orlando Army Air Base. A new airport was built 10 miles south of Orlando to replace the municipal airport. It was quickly converted into Pinecastle Air Force Base and eventually became McCoy Air Force Base. It is now the site of the greatly expanded Orlando International Airport. 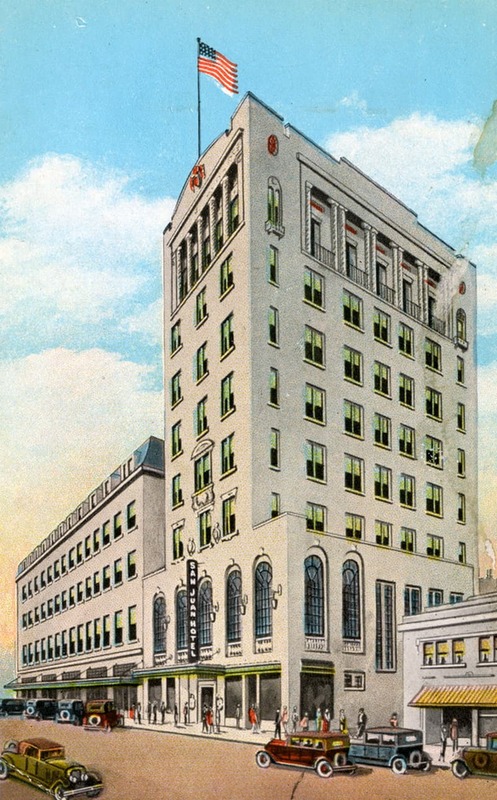 After the war, many of the servicemen and women stayed to settle down and raise families in Orlando, "The City Beautiful". In 1956, Martin Marietta (now Lockheed Martin), built a major aerospace defense plant south of Orlando on Kirkman Road. It became a major employer in the Orlando area. In addition to jobs at Martin Marietta, Orlando is close enough to Patrick Air Force Base, Cape Canaveral Air Force Station, and Kennedy Space Center for residents to commute to work from Orlando's eastern suburbs. The Beachline Expressway allows easy access to Port Canaveral, an important cruise ship terminal. Because of its proximity to the Space Coast near the Kennedy Space Center, many high-tech companies have shifted to the Orlando area. 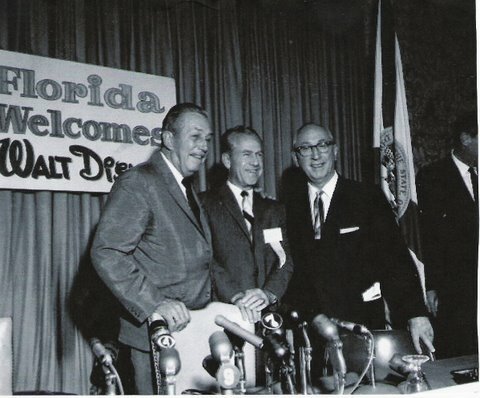 The biggest thing that ever happened to Orlando, however, was when Walt Disney announced in 1965 that he was going to build Walt Disney World near Orlando. I began working on Walt Disney World in 1968, and saw first hand the changes that came to Orlando Fla: some good, some bad. Walt Disney World opened in October 1971. Tourism rather than high-tech industry and agriculture became the majority of Orlando's economy. The population has exploded since then, and there are now probably as many tourism industry service jobs than high tech jobs. Orlando Florida now has more theme parks and entertainment attractions than anyplace else in the world. What was a sleepy small town airport shared with McCoy Air Force Base is now the giant Orlando International Airport. 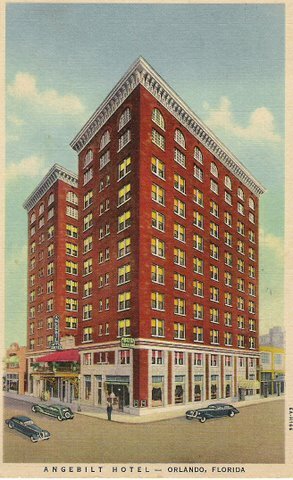 When Walt Disney World was being built, the tallest building in Orlando Florida was the 10 story Angebilt Hotel, shown in the postcard above. Now there are buildings as tall as 35 stories downtown. It's simple to enjoy the history of Orlando. Just drive away from Walt Disney World and the other theme parks and head toward the real Orlando.